Welcome Freshers! The start of your first term is a super exciting time for many reasons, but sport takes a particularly prominent place in the Michaelmas calendar. The first couple of weeks of term see try outs, taster sessions and the formation and bonding of new teams. Here are my top tips to get the most out of this sporty time of year. During Freshers’ week you will attend the Downing Sports and Societies Fair as well as the University Society Fair on Parkers’ Piece. There are literally hundreds of sports teams and societies available to you at Cambridge, both at a college and university level. Generally speaking, college level is more ‘chilled’, meaning there are far fewer training sessions; matches are on the friendly side of competitive; and they are open to all abilities and levels of experience. Make sure you take the time to look round these societies, and set aside an evening to eat your free dominos and read your rather large collection of leaflets. Playing sport is a fantastic way to meet new people at both college and university level. Although I’m super biased towards college sport, I stand by my argument that college sport provides one of the best opportunities to meet new people during your first term at Cambridge. The bonding power of Downing sport is impressive, and the earlier we can rope you into it, the better. The University Society Fair is especially useful for this. There are some pretty niche sports tucked away in Cambridge, whether you decide to go for a half blue in trampolining or join the ultimate frisbee team, there is something for everyone that you probably have never done before. These sports are particularly handy if you’re keen to play at a university level but don’t have the level of experience required to play a more ‘mainstream’ sport like rugby or lacrosse. (Having said that- always try out for anything you fancy the look of- don’t be put off by perceived lack of experience.) Even if you have never played sports before, there is something for you at Cambridge. College sport especially has a huge amount of novices who end up adoring the sport they play (shout out to the boys who take up college mixed netball). The Downing Freshers’ handbook is an exquisite piece of literature with an outstanding history (I wrote it last year). It tells you everything you need to know about college sport (and societies) at Downing, along with the email addresses of all the captains. Read it! It’s a great way to have a think about what you might fancy in a more relaxed setting- it’s harder to choose things when you have 20 overly enthusiastic captains pulling you over to their table at the Freshers Fair. My favourite thing about Downing is the relationship between the different year groups. The college family system gives you automatic friends in second year who are there to support you before and after you arrive. Combine them with the lists of sports team captains eager to recruit you, and you have a pretty wide base of sporty people to talk to before you even arrive at Downing. It will really help you orientate yourself and start thinking about how to spend your free time when you arrive at college. Students who currently play those sports are in the best place to give you an honest account of what the teams are like, so please, please ask us questions- we love to answer them! 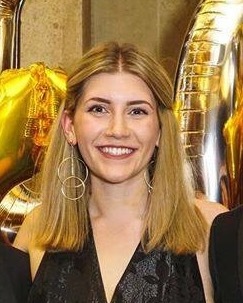 I'm Harriet, a second-year Geographer from Shropshire. I play netball, lacrosse and hockey for Downing, so I'm here to talk to you about all things sporty!